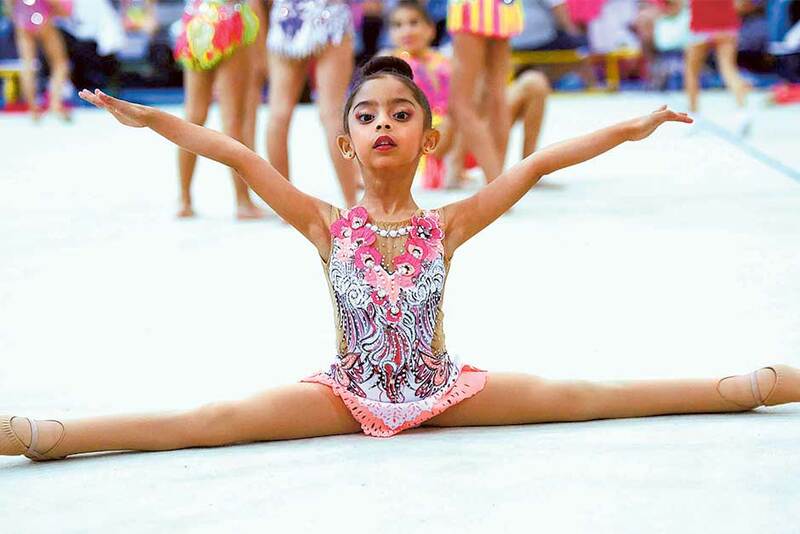 Dubai: Lamia Tariq Ali Abdullah may be only five years old, but she is already turning heads. The UAE girl outshone a strong field of more than 220 to clinch top honours at the end of the inaugural Dubai International Junior Rhythmic Gymnastics Championships held at the Horizon School hall over the weekend. For the tiny Lamia, the journey has just begun. 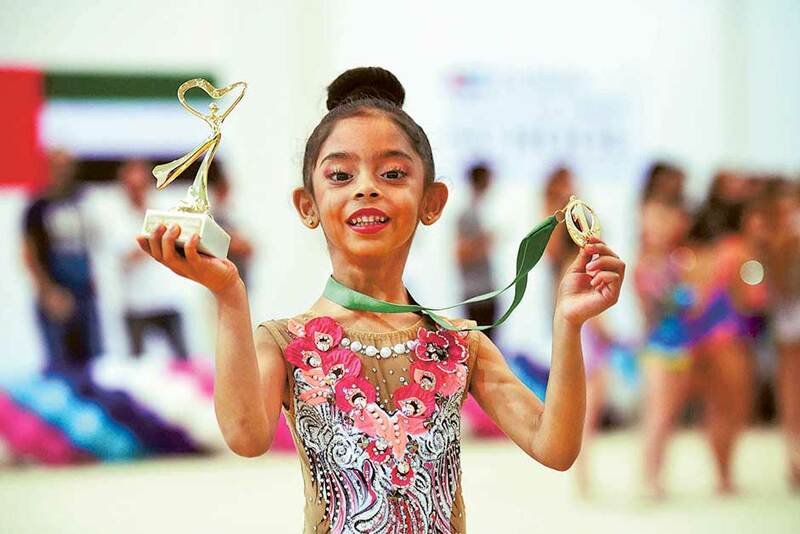 The bouncy eldest child of Malak and Tariq Ali — a former player of Al Shabab Club — her mum stumbled upon an advertisement on Facebook calling for trials to enter a new gymnastics school. “Given her ability to always do something without actually getting tired, I decided to apply and took Lamia for the trials without keeping too many expectations. The founder [Ksenia Dzhalaganiya] put Lamia through some trials and accepted her,” Malak recollects. That was only in May this year. Since then the young girl has worked hard and tirelessly to pick up her maiden gold medal at last weekend’s international championship that brought together competitors from Europe and across the Gulf region. “At first, she used to train for two hours a day. Gradually this went up to three hours and since the past couple of months, it has been four hours daily. She cries every day during training, simply because it is so tough both mentally and physically for a child of this age,” she adds. That pain was turned into gain over the weekend, and the achievement has thrown wide open Lamia’s future in the sport. The General Authority of Youth and Sport Welfare (GAYSW) has shown a keen interest in charting her course while the Dubai Sports Council (DSC) has already registered the five-year-old on their development programme. Young as she is, Lamia has two clear ambitions before her. “I want to meet His Highness Shaikh Mohammad Bin Rashid Al Maktoum, Vice President and Prime Minister of the UAE and Ruler of Dubai and I want to be the first UAE woman to win a gold medal at the Olympic Games,” she says matter-of-factly. When it comes to her sport, Lamia is extremely focused for her age. “I want to represent the UAE first at the Youth Olympic Games (YOG) and after that I want to target the Olympics,” she says. The inaugural edition of the YOG was held in 2010 in Singapore followed by the second edition in Nanjing, China in 2014. The third YOG are scheduled to be held in Buenos Aires from October 1-12, 2018, and by then Lamia will be just seven and way too young for international competition. “But there are the Games in 2023 (venue is yet to be decided) and I will be big enough,” her eyes pop out. “I am ready and willing to work hard, very hard and achieve my goals. I may cry now during training, but that is because I feel the pain in my bones and in my body. But one day I will overcome this pain and continue giving my sport everything I’ve got, and this will see me as the first Emirati girl to win a gold medal at the Olympic Games,” she smiles. “And then, I will definitely get to meet Shaikh Mohammad,” Lamia added. 2011 category (first timers): 1. Lamia Tariq Ali Abdullah — Dubai Youth Olympic School, UAE — 8.45pts; 2. Anna Sepkutan — Mariupol Sdyushor #5, Ukraine — 7.9pts; 3. Angela Scudella — Dubai Youth Olympic School, UAE — 7.5pts. 2003 category: 1. Inkar Dzhulmagambetova — Atyrau Club, Kazakhstan — 29.5pts; 2. Yasmin Kaliyeva — AZ Madina School, Kazakhstan — 28.2pts; 3. Abigail Scanlon — Dubai Youth Olympic School, UAE — 27.5pts.